Melt flow test showing Alberta Slip beside Albany Slip. Imagine making cone 10 glazes using 90%+ of just one material and adding colorants, opacifiers, variegators, glossers or matters! Or doing the same at cone 6 with an additional 20% boron frit. Alberta Slip is blend of materials mined by Plainsman Clays to duplicate the chemistry and fired properties of the classic Albany Slip (no longer available). Glazes employing it are easier to apply, more consistent and functional! Alberta Slip works all by itself as an excellent cone 10 glossy brown (in oxidation) and tenmoku or glossy brown (in reduction). Alberta Slip as-a-base is a better way to make the classic cone 10 celadon, tenmoku, iron crystal and bamboo recipes. 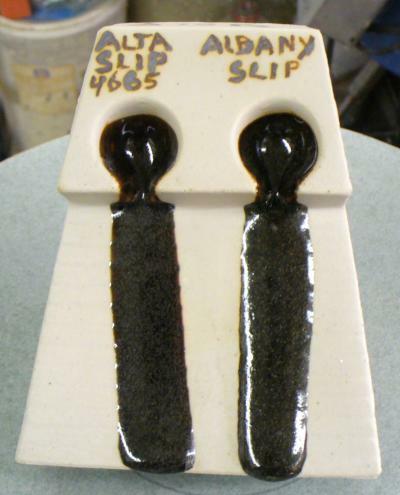 Because Alberta Slip is a clay and a melter, your glaze will suspend and flow well. Alberta Slip is adjustable, you can make slurries that are a pleasure to use, they do not drip, curtain, powder, crack and settle like so many others. 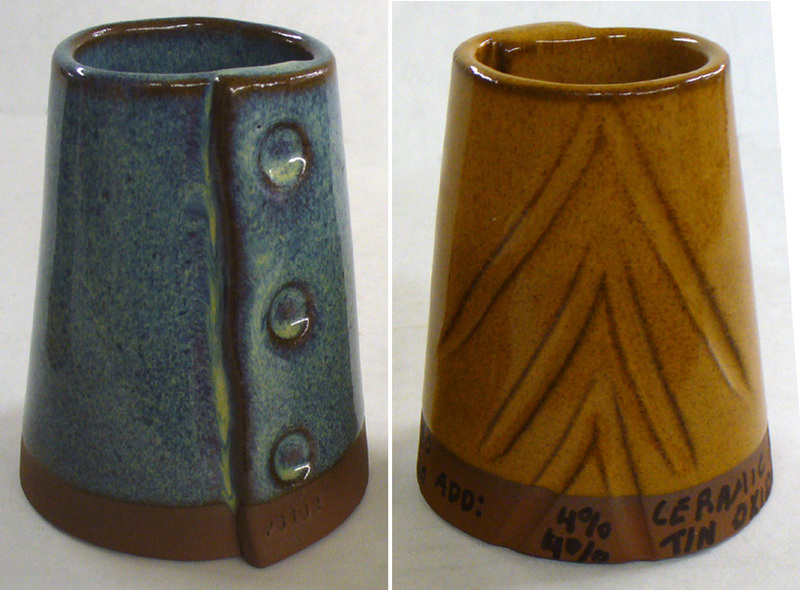 In educational and beginning pottery settings it is an ideal starting point for material-blending style glaze development. It can be used to substitute for Albany Slip in just about any glaze. Just add 20% boron frit (e.g. 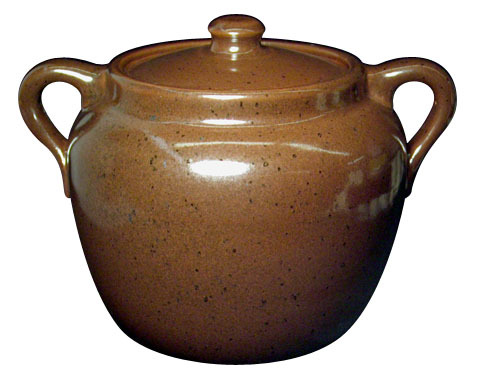 frit 3134) and you have a glossy amber transparent that makes an ideal liner glaze for both light and dark stonewares. Add a little rutile, titanium or tin to bring the base alive and then other colorants to create a variety of stunning glazes. With a proper firing that soaks the ware you will get beautiful and vibrant fired surfaces. The Alberta Slip world of glazes follows on the heels of Albany Slip. It was used in a wide range of glazes for generations (google "early american stoneware", most of the brown-glazed ware was done using Albany Slip). We are developing and adding recipes and pictures to this web site on an ongoing basis. You are also invited to submit your Ravenscrag Slip recipes and share ideas. Alberta Slip is a dark burning quite plastic material, Ravenscrag is a light burning silty material. Both melt well at cone 10R and need frit to melt at cone 6. Alberta Slip really shines at cone 10R for creating classic cone 10 celadons, tenmokus, iron crystals and bamboos. We have more recipes for Alberta Slip at cone 6, however since Alberta Slip contains significant iron it is only suitable for darker colors. Alberta Slip additions need to be a mix of calcine and raw if the percentage is more than about 40. While being an extra effort it also means you can control the shrinkage and hardness of the drying glaze. Alberta Slip makes a better transparent for use on dark burning bodies. At cone 10R you should be using both.